If you are on The Twitter, you most likely know that it was Blissdom weekend here in Nashville. What's Blissdom you ask? I still don't really know...but it is some sort of big social media conference. In other words, lots of my favorite bloggers were coming to town! This was also the weekend I would finally get to meet Jen! It was kind of like a blind friend date/I feel like I've known you my whole life moment. She and Carsyn came to play at our house on Friday afternoon. Grayson & Carsyn had SO much fun together. It was so fun! These 2 were born on the same exact day, 3 hours apart. Jen and I are due with #2 within a week of each other. Crazy! We had plans on Saturday morning to attend a 1st birthday party and then spend the afternoon with Jen & Carsyn. Grayson had other plans apparently. While we were getting ready for the party, he decided to climb on the couch upstairs. Not only did he climb on to the couch, but he decided to stand on it. Then? He fell. Grayson landed on his right shoulder and arm & was crying so hard. We thought he popped his shoulder out of place. After about 20 minutes of crying, we decided to take him to our pediatrician to do an X-Ray. The doctor looked at his collar bone & shoulder...all fine. Then he said the dreaded words no mama to a 17 month old ever wants to hear: "I think he may have a fracture in his lower arm." 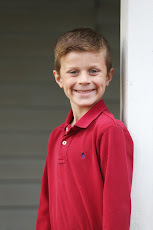 After some X-Rays (which sweet G hated) it was confirmed that he did indeed fracture at least one bone in his lower right arm. They splinted it & then bandaged it. The doctor also said to "reign him in a little bit so he doesn't fall on it." HA! Famous last words. 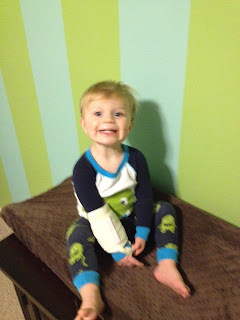 We go to an orthopedic doctor tomorrow to hopefully (fingers crossed) get a real cast. 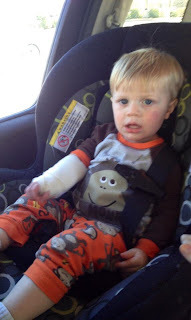 This whole velcro bandage thing isn't working out too well since G knows how to undo it. 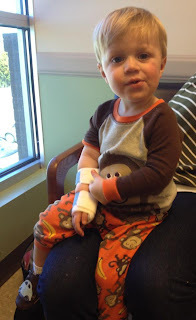 Our little stunt man was so brave & has been such a good sport with his bum hand. He is still even playing basketball! And trying to climb everything...oy. So, after our 2 hour ordeal, we missed the party & had a VERY sleepy boy on our hands. I had originally planned to spend the night with Jen at the Opryland Hotel on Saturday & Ben promised he and the gimp child would be okay...so I went. First night away from the child & I survived! Ben sent me this picture on Saturday night before bed. I think it is safe to say that Grayson had a great night at home with his daddy! We had a blogger brunch planned on Sunday with some local girls I had never met in person and some girls in town for Blissdom. 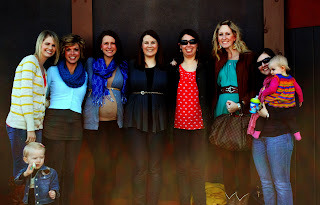 We went to The Copper Kettle downtown and had such a great time. It was seriously like we had all been friends forever & we just talked for 2 hours! That is why blogging is so fun. Now if I can just figure out how to get these out of towners to move to Nashville, then it would be perfect! It was such a fun weekend, broken arm & all! Now? I need a weekend to recover from my weekend. I'm so glad G is doing well, broken arm and all. Hope you get the cast so you don't have to fight the bandage battle with him every day. So fun that you and Jen finally got to meet! Looks like it was such a fun time! Have a great week! G knows how to rock that splint! So glad we all got to meet! It was the most fun 2 hours of girl time I've had in a long time! Waaaa! That was so fun but now it's over! SNIFF SNIFF! We MUST plan something again! It was way too much fun! SO wonderful meeting you! Thank you for the pictures!!!! Email them to me if you don't mind!!!!! Glad G is doing better! Hoping for a real cast!!!!! Sounds like everyone had a great time at Blissdom! I wish I couldn't have attended. Hmm, maybe next year?! Oh no - I hope he is on the mend so soon!